The BRDC British F3 Championship heads to Rockingham this weekend with two Scandinavian drivers leading the way in the championship standings. Strong weekends at the season-opener at Oulton Park over the Easter weekend mean Carlin’s Nicolai Kjaergaard and Double R Racing’s Linus Lundqvist are currently top of the tree heading to Northamptonshire but, as the Oulton Park weekend proved, there are any number of drivers capable of running at the front of an international field. Lundqvist claimed the first win of the year at Oulton Park to back up his championship credentials, before Manuel Maldonado and finally Kjaergaard each claimed victories, while a total of eight drivers went home having secured a podium finish during the weekend. Each victory was claimed by less than a second, and the hard fighting will most definitely continue at Rockingham this weekend! Kjaergaard holds an 18-point lead in the standings over Lundqvist heading to Oulton Park, by virtue of his win and race one podium, while Fortec’s Tom Gamble is just three points further adrift, the young Brit taking his first F3 podium in the soaking wet final race at Oulton Park. Lanan Racing’s Indian charge Kush Maini sits fourth in the standings, a position boosted by his podium in the final race of the Oulton Park weekend. He’s shown continuous strong form in testing and will be determined to make that show in racing conditions this weekend. Douglas Motorsport’s Jamie Chadwick and Carlin’s Billy Monger have equal points, with both claiming podiums at Oulton Park. 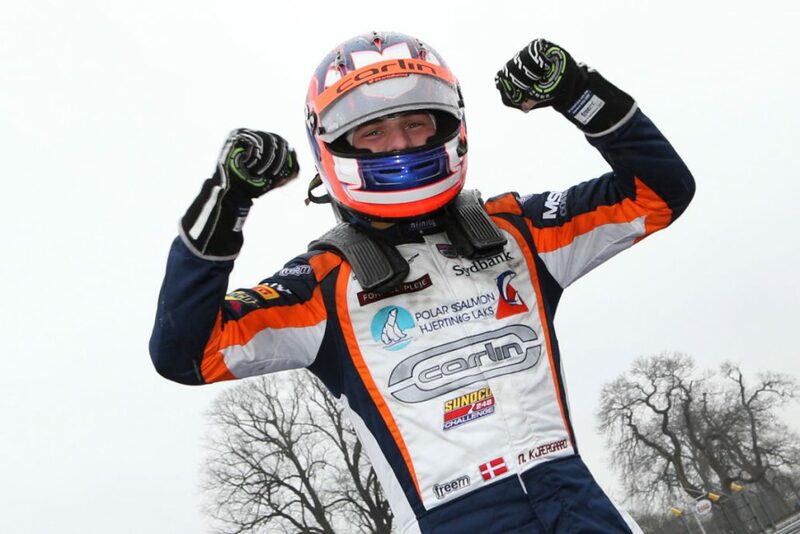 Chadwick’s third place in race two was her second rostrum in British F3, while Monger’s third place in race one was a dream comeback to racing after his 12-month layoff following his Formula 4 accident. Both drivers racked up the column inches afterwards, and will be keen for more in Northamptonshire. Oulton Park race two winner Maldonado tasted his first ever car race victory last time out. He’s within touching distance of the drivers ahead of him, and six points clear of Clement Novalak, who showed prodigious pace at Oulton Park but didn’t quite have the luck to go with it. Tristan Charpentier, and Krish Mahadik complete the early championship top 10 heading into the second weekend of action. Sasakorn Chaimongkol showed excellent consistency for Hillspeed at Oulton Park and lies just outside the top-10, while Arvin Esmaeili on his F3 debut delivered three decent showings. He’s a single point ahead of Sun Yue Yang, who proved he means business this year with a sixth place in the first race of the year. Pavan Ravishankar and Ben Hurst banked three good results at Oulton Park and lie ahead of Douglas Motorsport’s returnee Jordan Cane, who has since confirmed he will compete the full season. He’s determined to make amends from a tricky opening round after a last minute call-up, and the three-time winner from 2017 must be considered as a prime championship contender. Chris Dittmann Racing’s Chia Wing Hoong meanwhile enjoyed moments at the front of the field at Oulton Park, and will be keen for a better slice of luck this weekend. A 19-car field covering 12 nationalities is expected at the Northamptonshire speed bowl, with Lanan Racing’s Josh Mason, and Hillspeed’s Jusuf Owega set to make their debuts. Both have a good deal of experience at the wheel of the Tatuus Cosworth BRDC British F3 car, and will be aiming for a strong starts to their British F3 careers this weekend. The BRDC British F3 action commences with four test sessions on Friday, while qualifying starts at 10.40 on Saturday ahead of the first race at 14.15. The exciting reverse grid race two starts at 11.05 on Sunday morning before the final encounter kicks off at 15.25. All the drama at Rockingham can be followed on the official BRDC British F3 Championship website, with live timing and updates throughout the event. TV highlights will be available on ITV4 a week after the event, as well as across the Motorsport.tv network and BT Sport.